1) Pair them with sneakers, or booties - not sky-high platform heels. 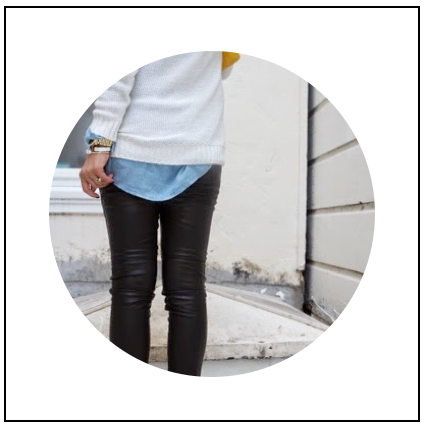 Leather pants are pretty look at me, so flats really channel "cool girl" whereas heels kind of channel "call girl." 2) Cover your bum. Here, my beloved linen/chambray shirt does a good job of hinting at curves, without flashing that bass. 3) Mixed metallic etallic accessories and a bold purse help the look holidazzle, without going over the top. 4) There's a reason fashion girls love Rayban Aviator Sunglasses, and it's because the classic shape is just everything. 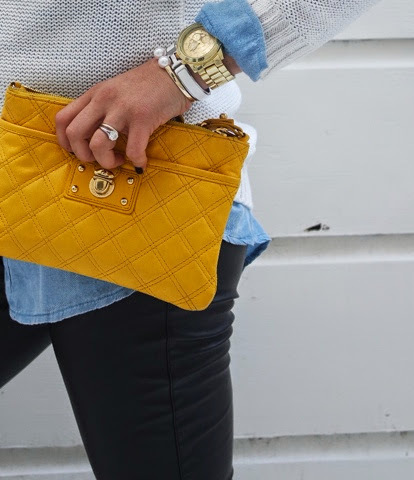 5) Chunky, slouchy knits are effortless. If you don't own at least one sweater, I just don't know what to do with you.